Nafiseh Emadmosto ’s bold gural paintings offer up representative and allegorical examinations of ideological conflict, and the power of art to inspire protest, incite censure, and yet also speak to a collective (and contested) desire to envision a better world. Emadmostofi's work was selected from a call to graduating students from the University of Toronto, Mississauga and Sheridan College’s Art and Art History Program. Nafiseh Emadmostofi was born in Tehran, Iran. After immigrating to Canada, she pursued studies in Art and Art History and Psychology at the University of Toronto Mississauga and Sheridan College. She is the recipient of numerous awards during the course of her studies, including the Faculty Award for excellence in Painting. Emadmostofi's work has been shown in group exhibitions at University of Toronto, and Sheridan College and recently she was part of a team that created a mosaic mural for the Iranian Women's Organization of Ontario and Scarborough General Hospital. The swan has always been a figure to which metaphorical and allegorical significance has been fixed. In art and literature it can denote purity, love, beauty. In The Threatened Swan, a notable work by Dutch painter Jan Asseljin (c. 1610 - 1652), it was said to personify the Dutch state, defending the country against an encroaching enemy, represented in the painting as a dog. 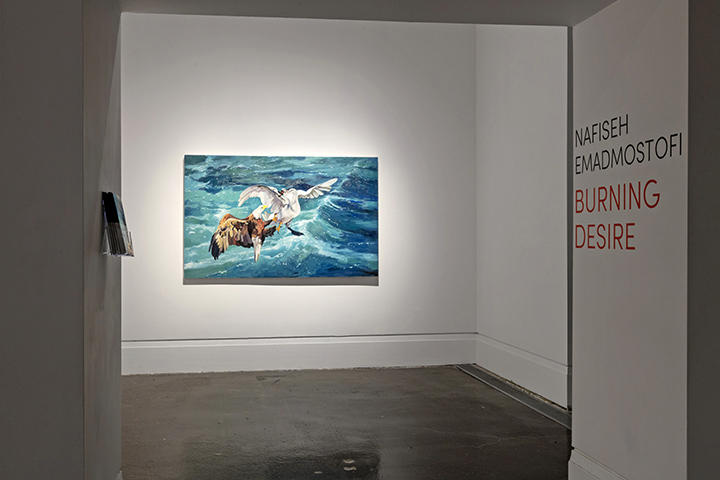 Nafiseh Emadmostofi's The Eagle and the Swan, the largest of three paintings in her exhibition at the AGM's XIT-RM, refers visually to Asseljin's work, the swan's posture echoing that of the original. Emadmostofi has substituted an eagle for the dog, another avian stand in for the state, in this case perhaps the more predatory, intimidating authority of our neighbour to the South? This interference of the apparatus of the state in the arena of arts and culture forms the basis of Emandmostofi's work in Burning Desire, both allegorically, as in The Eagle and the Swan, and representationally in Do it Yourself Coffins I and II, depicting piles of books engulfed in flame. Although Emadmostofi is inspired by the practices of artist such as Leon Golub (1922 - 2004) whose allegorical works made incisive commentary on pressing social issues of their time, the influence of her background in journalism also seems of note, perhaps contributing to the topical, perspicacious nature of the work. 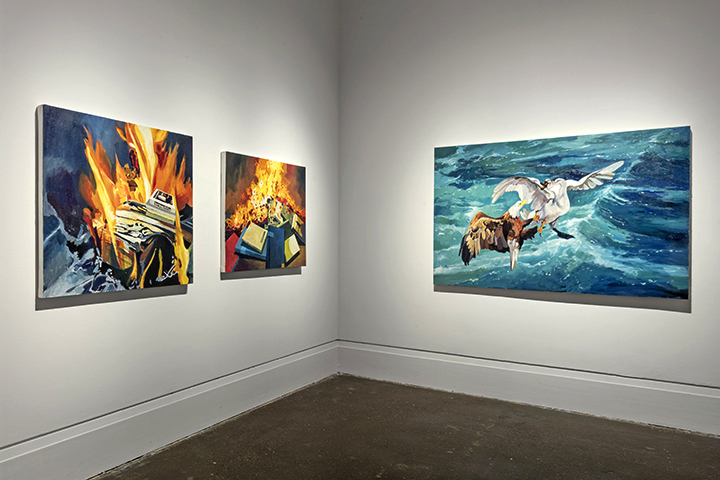 The burning of the title is literal, in the form of the fires consuming the books in Emadmostofi's paintings, book burnings to which she was witness in her native Iran. Repressive regimes' fervour to destroy creative output speaks to the power of art to critique the status quo and foment dissent. Indeed book burning frequently occurs alongside the destruction of other art forms, and is not only consigned to history - one has only to see the looting and demolishing of archeological sites in Syria by factions of ISIL to know that we must remain constantly vigilant to threats to artistic freedoms. This burning desire csn fsn yhr flmaes of nascent civil action, from labour strikes to democratic revolutions, but also seems to spark the need for restrictive governments to control all forms of media. However vivid the images in her work may be, Emadmostofi does not to proselytize; the viewer must determine for themselves which narrative, which side of the story they choose to see. Indeed only one book title is visible/legible, in the eponymous work Do it Yourself Coffins I. A quick search of the internet proves that this is, surprisingly, the title of an actual, if esoteric publication. However, aside from the morbid humour in ostensibly preventing people from learning how to build their final resting place, the artist perhaps obliquely suggests that those who burn books are sealing their own fate on the wrong side of history. At its heart, Burning Desire is about the power of art to disrupt, and its conflicting potential to both inspire activism and protest, and incite censure, while at the same time speaking to a collective (and contested) desire to envision a better world. Burning Desire, XIT-RM, Art Gallery of Mississauga. Photo by Toni Hafkenscheid. Banner image credit: Nafiseh Emadmosto, Do it Yourself Coffins I, 2016, oil on canvas, 37 x 40 inches.